100% processing speedup allows to use more sensors. Built-in visualization and plausibility checks let you analyze and integrate faster. Develop your data fusion in ADTF and other middleware systems. The number of sensors for automated driving functions and the associated computational load is increasing steadily. Systems consisting of more than 10 sensors are being developed more and more frequently and are thus placing new demands on the performance of prototypes and data fusion algorithms. Our tool BASELABS Create allows to quickly develop data fusion algorithms that use many sensors and to run them on typical prototyping platforms. We aim at enabling faster results for each developer of environment perception systems while reducing the effort for inhouse software development and maintenance at the same time. 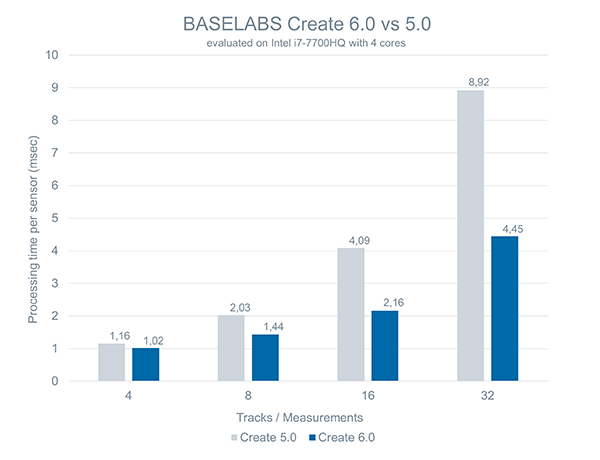 BASELABS Create now executes up to twice as fast to allow the integration of more sensors. To analyze the behavior and performance of the data fusion algorithm, visualization became part of BASELABS Create. Additionally, BASELABS Create analyzes input data for plausibility to allow a faster middleware integration. We would like to highlight that BASELABS Create is compatible to many middleware systems like ADTF, vADASdeveloper, RTMaps and ROS. Enjoy developing! We look forward to supporting your activities in prototyping and series projects. Please contact us for your requirements and to share your experiences with our products. BASELABS Create generates source code that automatically leverages the processing on multiple CPU-cores so that more tracks or more sensors can be processed in the same time. When compared to the previous release, this means up to 100% increase in processing speed. The data fusion designer of BASELABS Create allows to configure complex sensor setups with multiple sensors. From these setups, dedicated data fusion algorithms are generated and then integrated to various middleware systems like ROS, ADTF, RTMaps and vADASdeveloper to feed sensor data to the algorithms. To analyze the current system behavior and performance, developers require a rich and customizable visualization that shows all relevant information in an integrated way. This includes the field of view of all sensors, the measurements from the sensors and the actual result as well as the reliability of the data fusion. 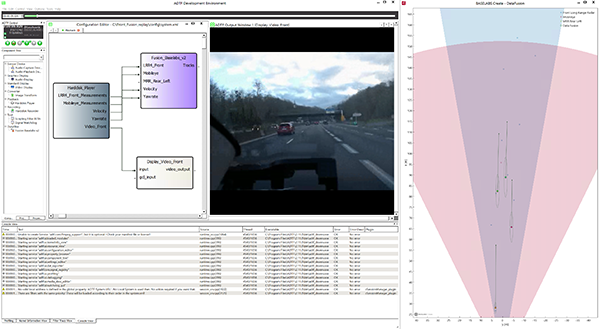 BASELABS Create visualizes data fusion results, the sensor fields of view and sensor data in a bird’s-eye-view according to the configured sensor setup. From that, data fusion developers can quickly analyze the behavior and performance of the data fusion system. 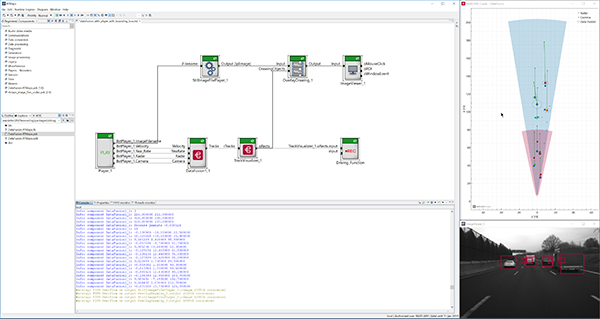 In BASELABS Create, the visualization is auto-generated from the configured system and thus automatically adapts each time the configuration is changed, e.g. if the mounting position of a sensor is calibrated or a new sensor is added. The generated source code of the visualization is extensible and customizable so that additional information can be easily displayed. The visualization runs side-by-side in all supported middleware systems on Windows and Linux. In this video you get an impression of the new visualization feature of BASELABS Create. The integration of a data fusion algorithm to a middleware is a demanding task that sometimes introduces unintentional errors such as incorrectly converted time stamps or sensor data, invalid ego motion data or repetitive sensor measurements. Often, these errors are hard to find and thus require additional development time. BASELABS Create provides an optional and configurable plausibility check to detect typical errors in sensor data and its time stamps. This decreases the number of potential error sources and accelerates the integration. In this video you gain more insight into the new data fusion input plausibility check. For the integration and execution of a data fusion algorithm generated by the data fusion designer of BASELABS Create, a middleware for sensor data acquisition, recording and replay is typically used. A well-established middleware is ADTF. BASELABS Create supports ADTF by its interfaces for the C/C++ language. Through these interfaces, the generated data fusion systems execute on Windows and Linux and can target x86, ARM and PowerPC architectures. The built-in visualization of BASELABS Create is compatible with ADTF. The T.U.C. Racing Team is the biggest student association in Chemnitz. We are supporting the team through a yearly sponsorship. Why? 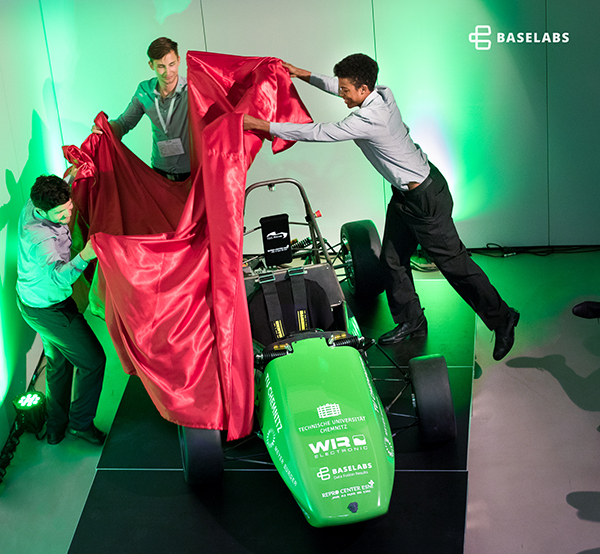 The approximately 50 members develop, manufacture and market a fully-electric racing vehicle. Their efforts contribute to the evolution of the future of driving, which meets our general motivation. The team is taking part in this year’s international design and construction competition ”Formula Student Germany“, taking place at the Hockenheimring since 2006. After a successful qualifying they are going to be launched in the race of the section ”Formula Student Electric“. A few weeks ago, the members presented their vehicle in a rollout video. We keep our fingers crossed for August.